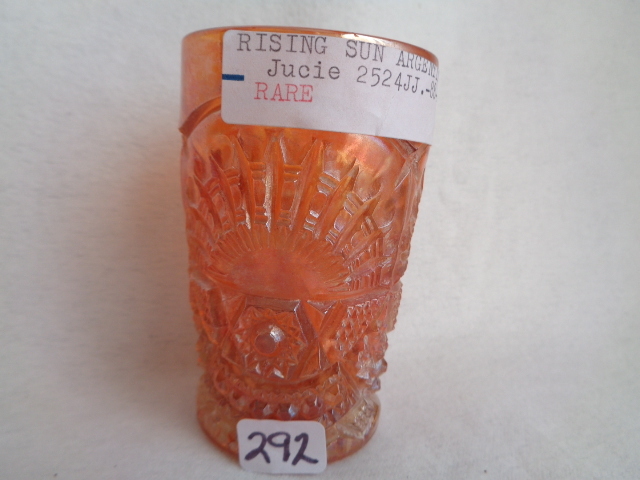 Nobody is quite sure who made the Rising Sun pattern. 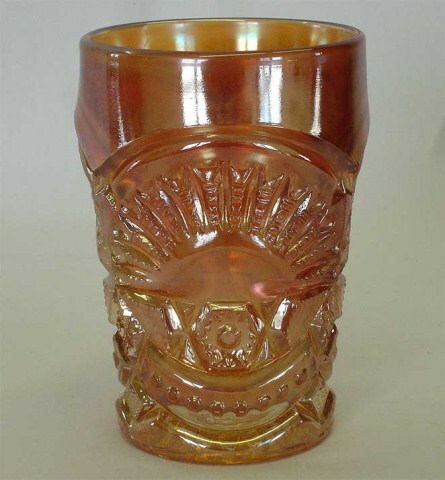 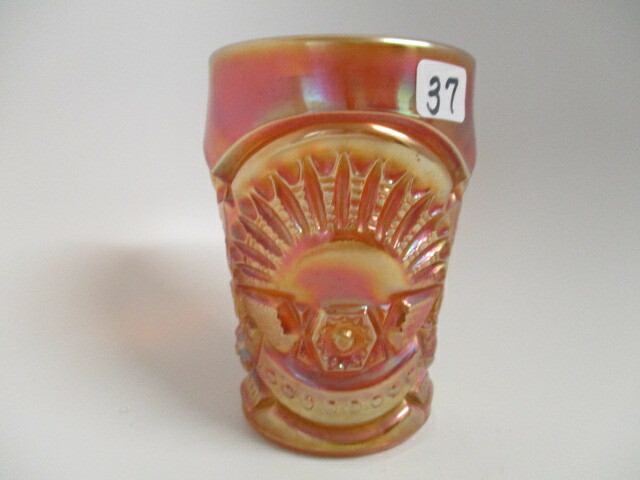 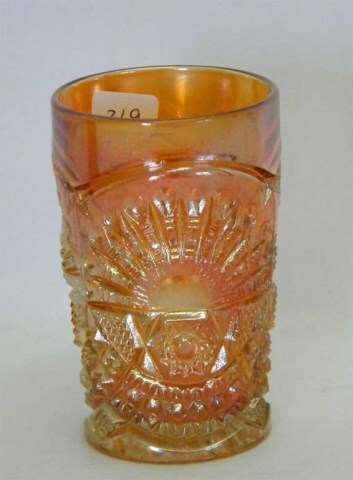 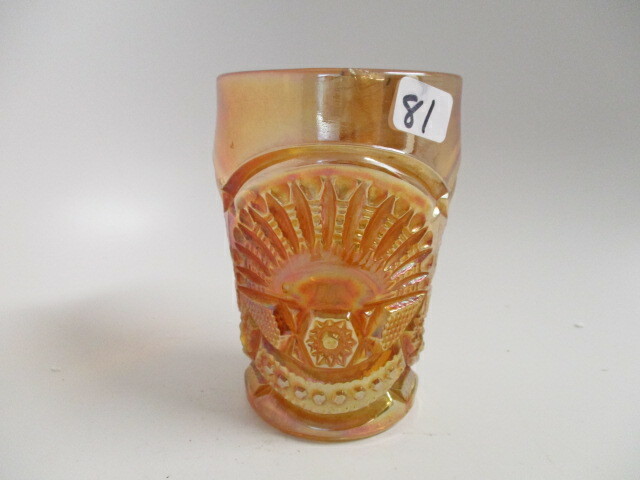 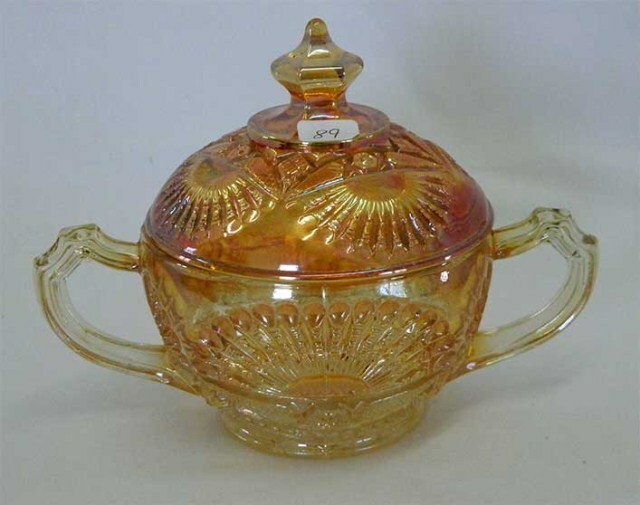 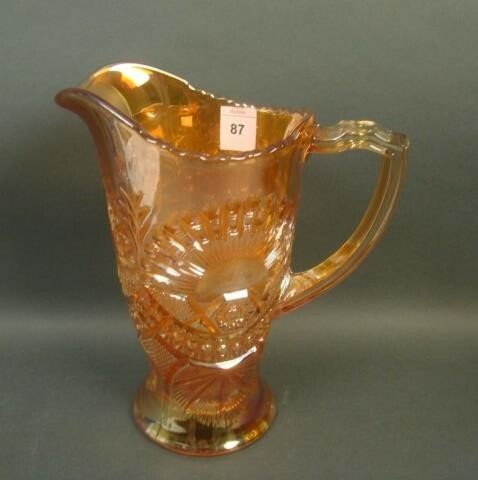 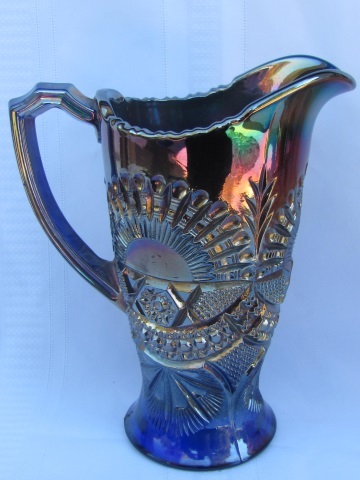 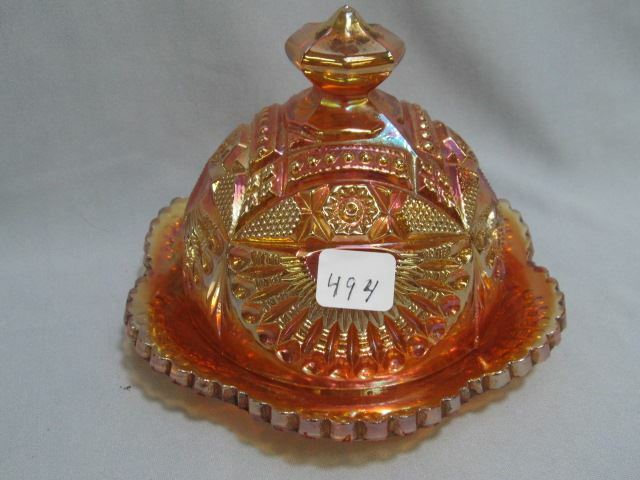 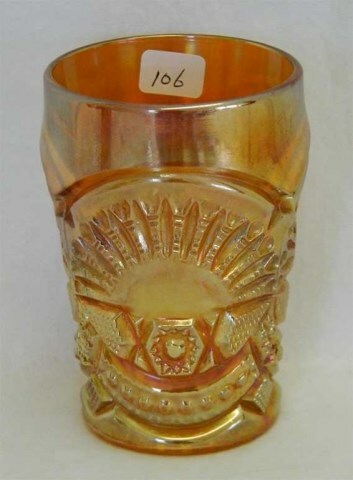 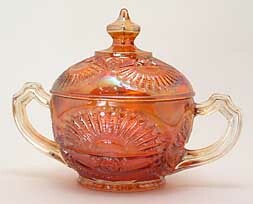 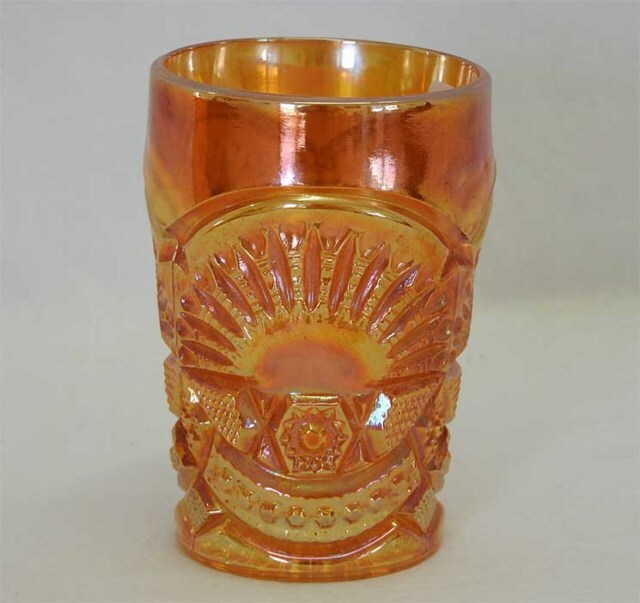 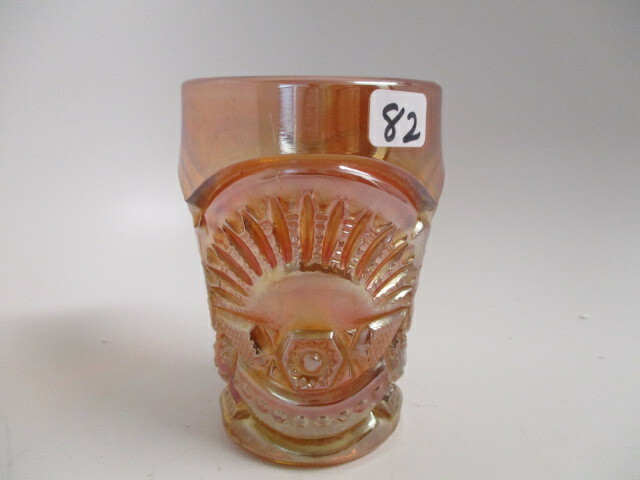 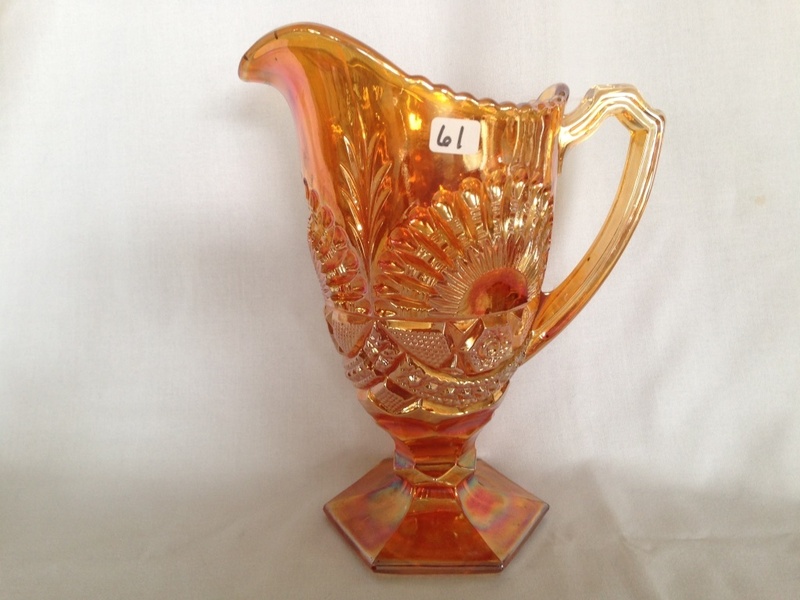 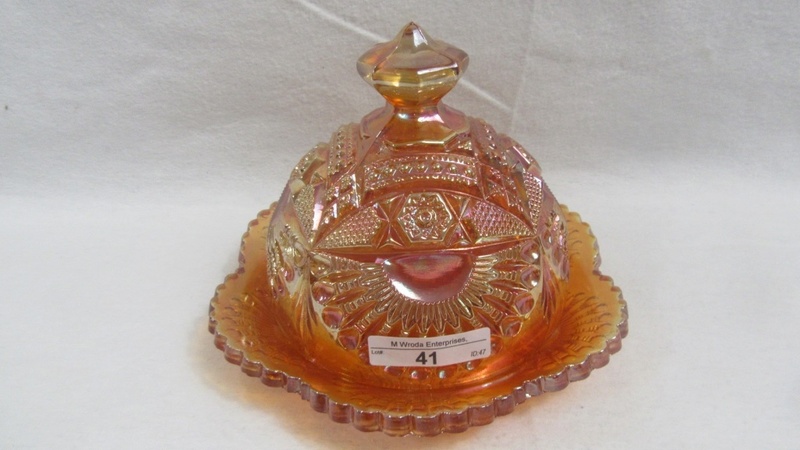 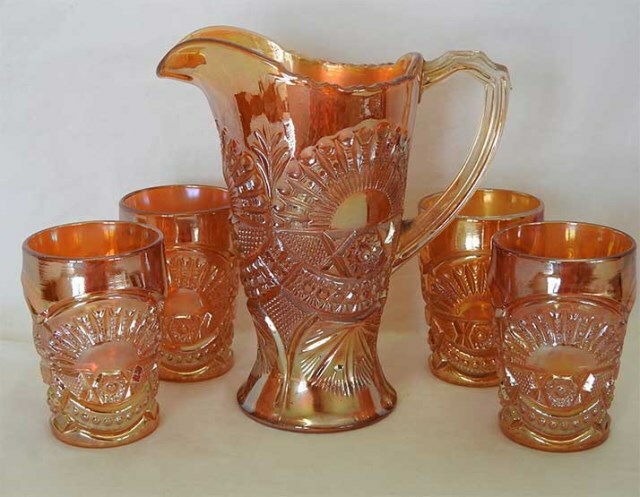 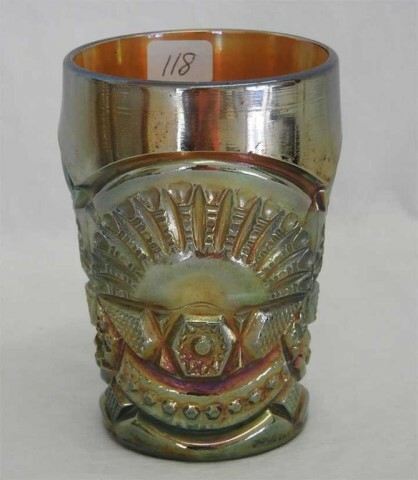 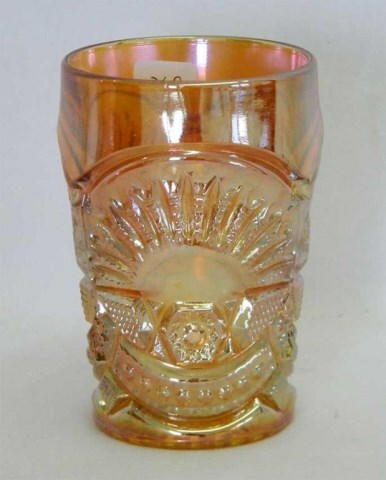 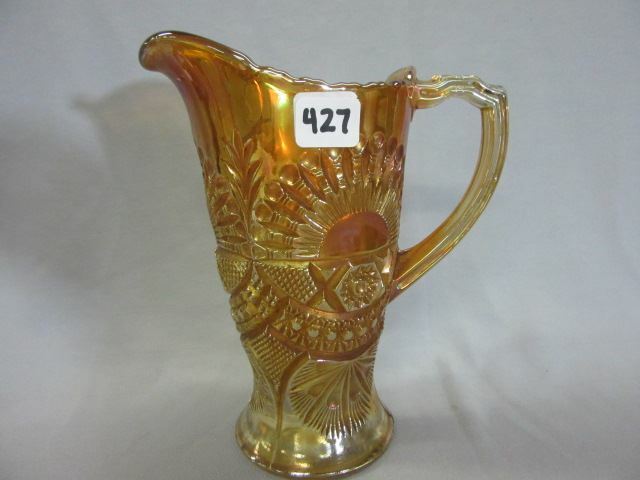 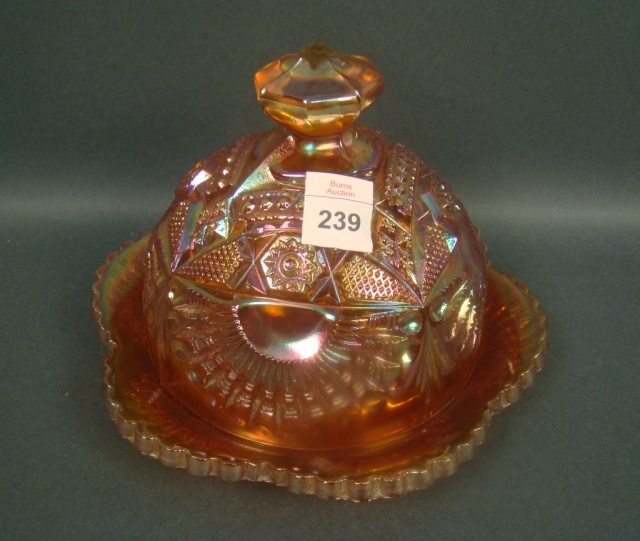 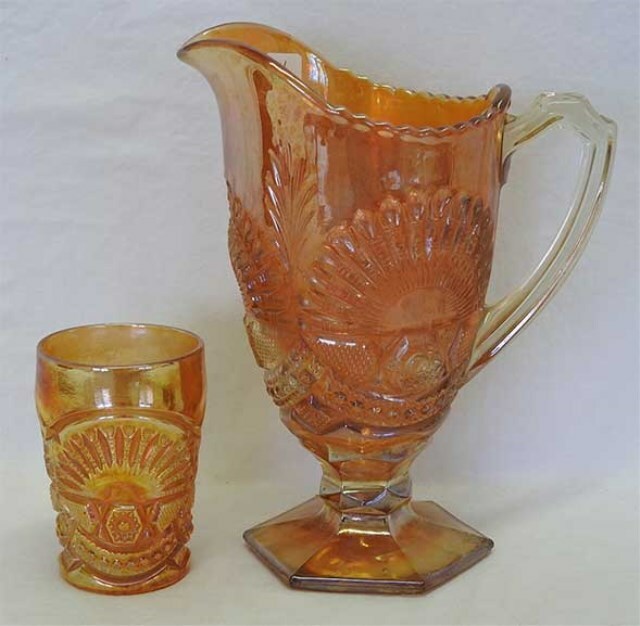 It's shown in an old US Glass Company catalog in uniridized form, but many pieces have been found in Argentina–leading to the speculation that US Glass may have sold the molds to an Argentinian glass maker. 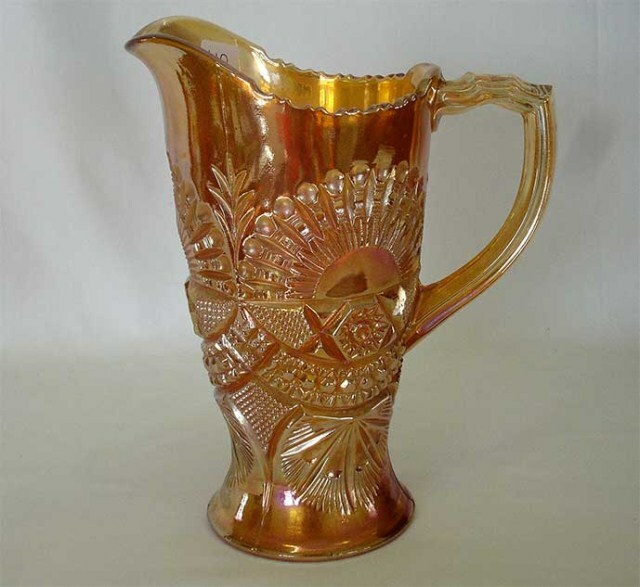 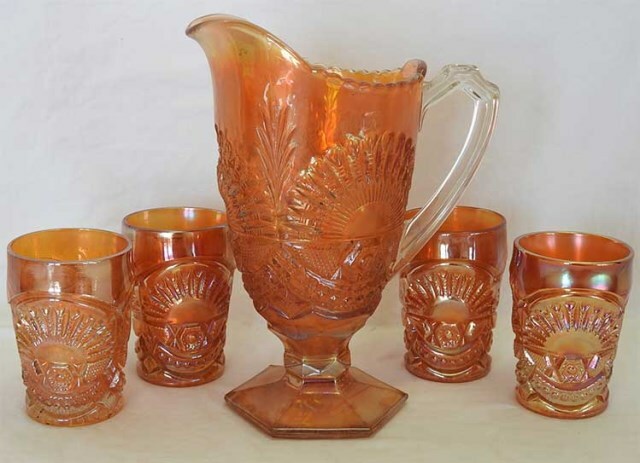 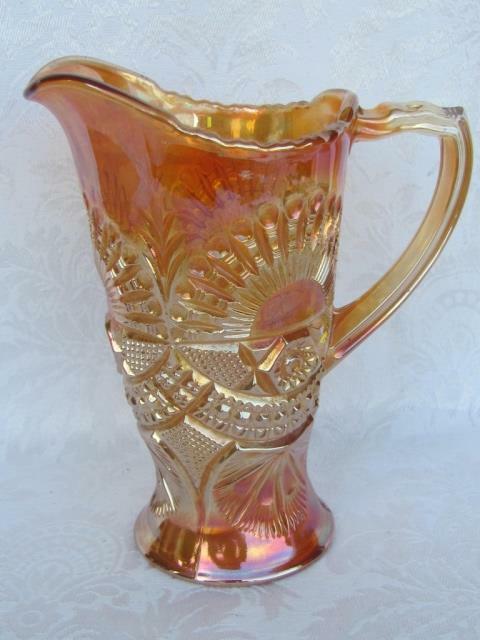 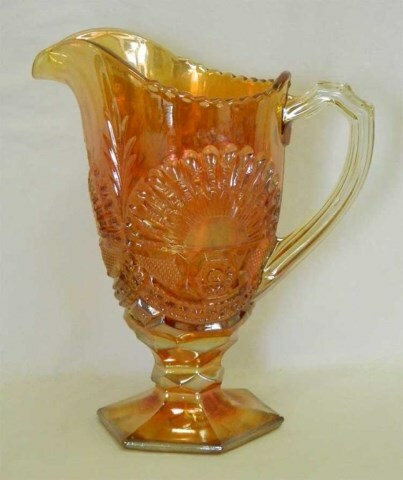 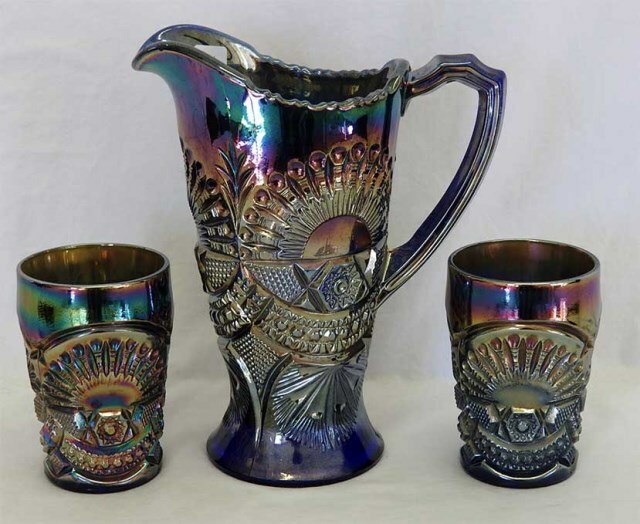 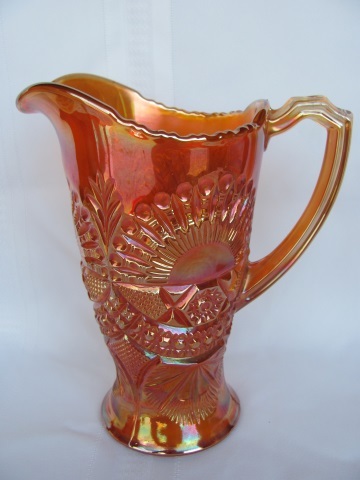 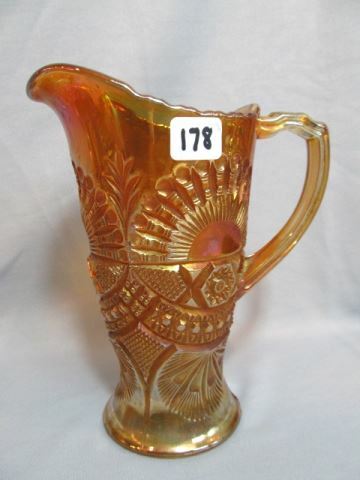 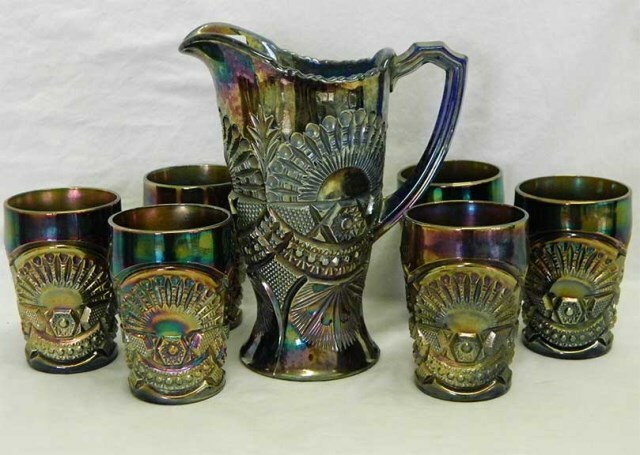 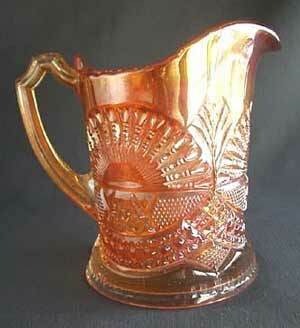 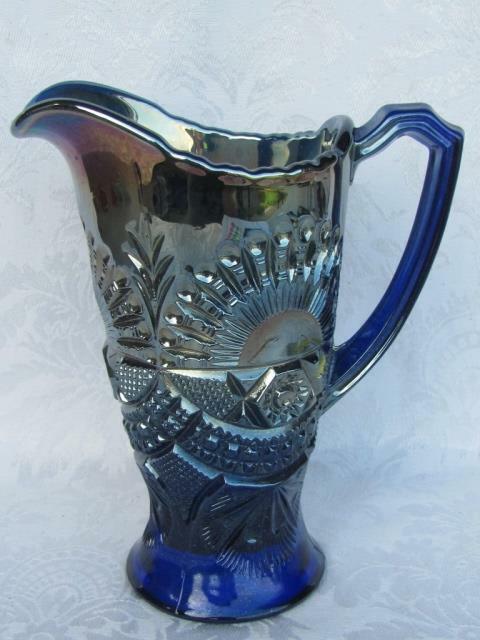 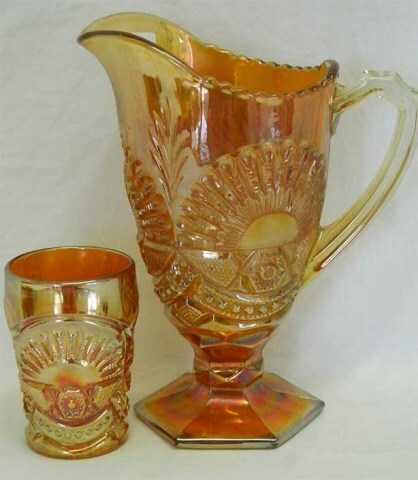 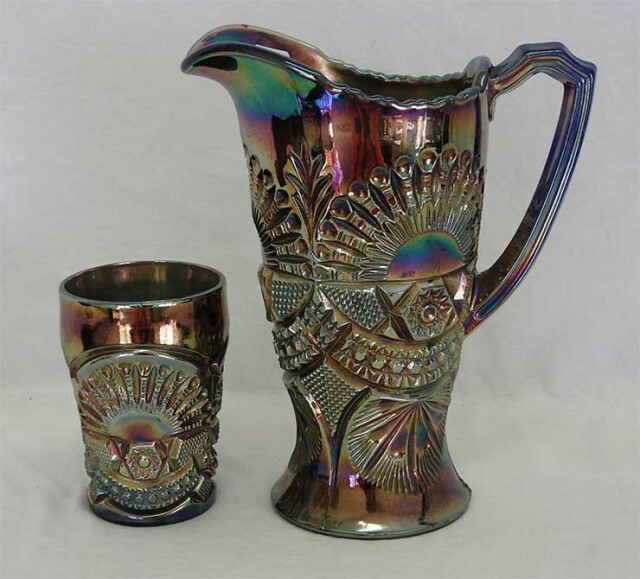 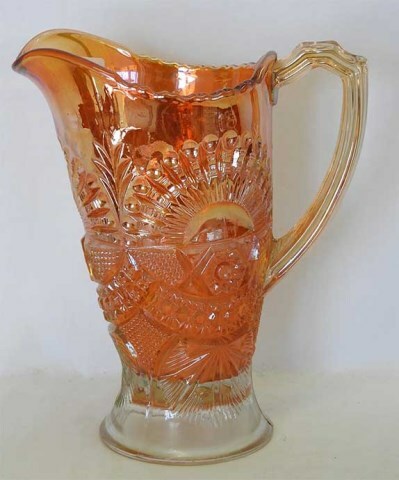 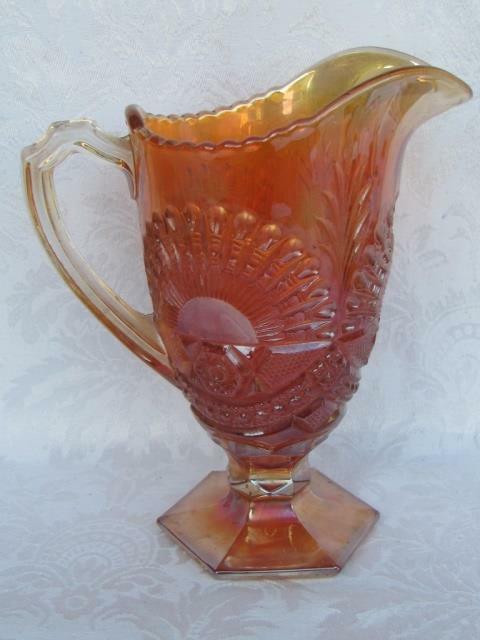 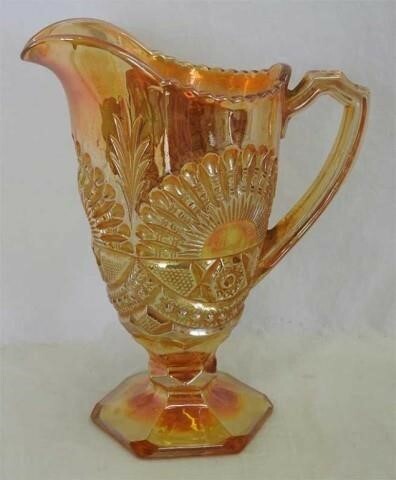 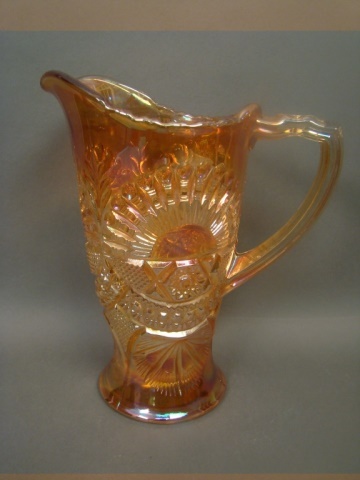 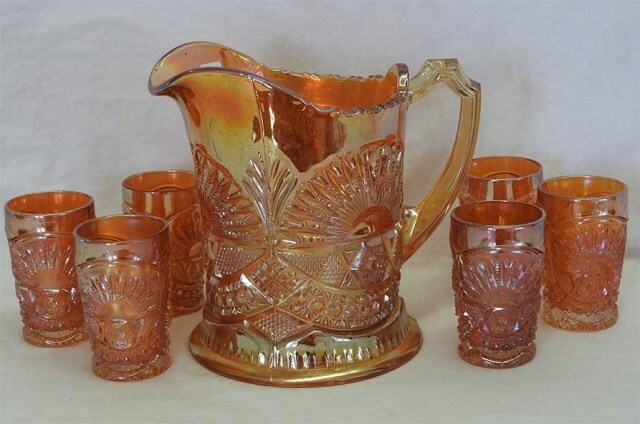 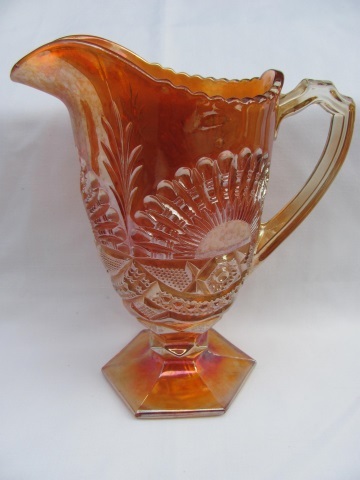 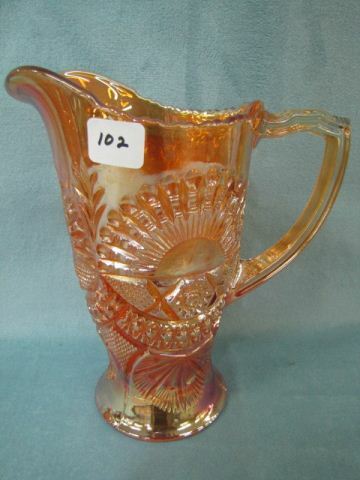 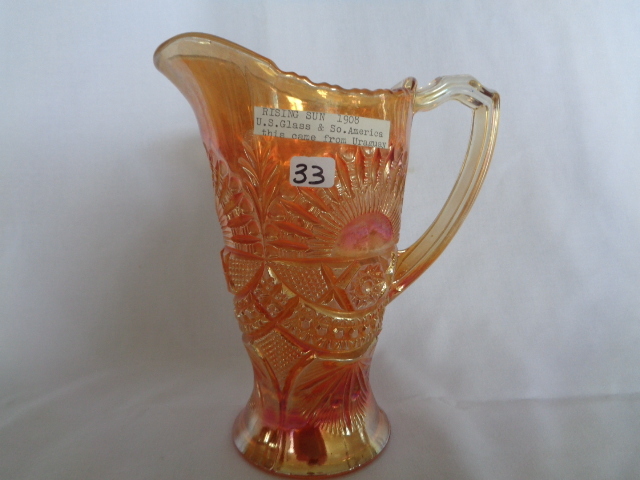 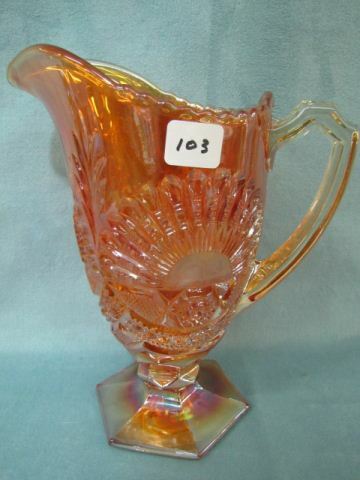 There are three pitcher styles known in the pattern: Above left is the water pitcher, a pedestalled piece that is 9 1/4 inches tall; in the center is the juice pitcher that has a slightly domed base and is 8 1/4 inches tall. 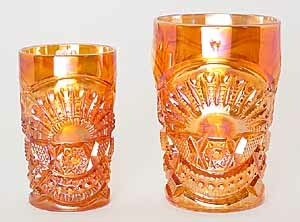 The third, above right, is squatty and 7 1/2 inches tall. 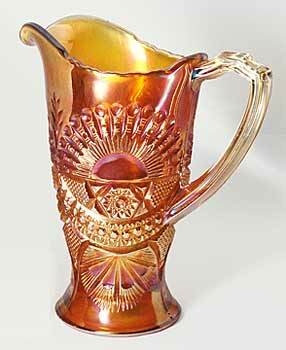 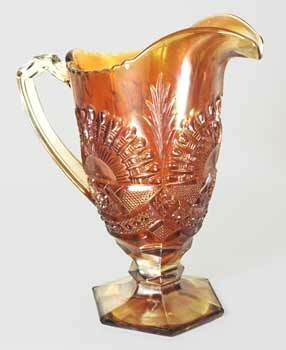 Only a few of these squatty 7 1/2-inch Rising Sun pitchers have been reported, although there are bound to be more out there. 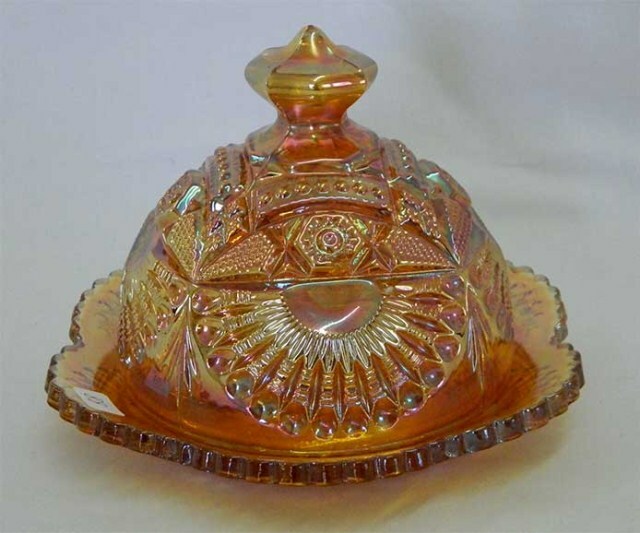 Above left is a covered sugar. 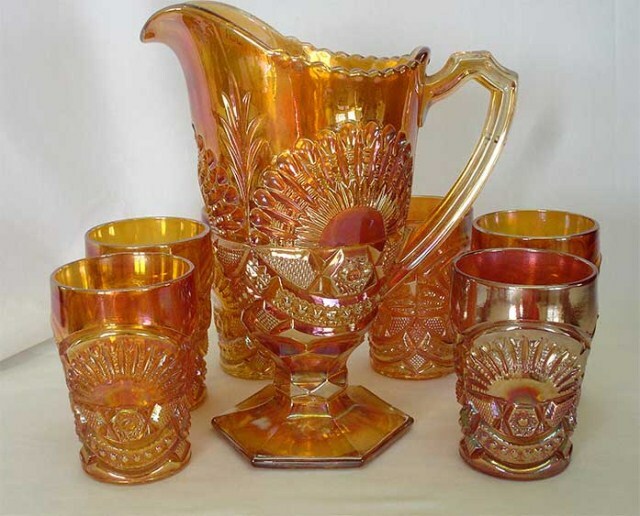 Pictured above center are the juice glass and regular tumbler (courtesy of Carl and Eunice Booker). 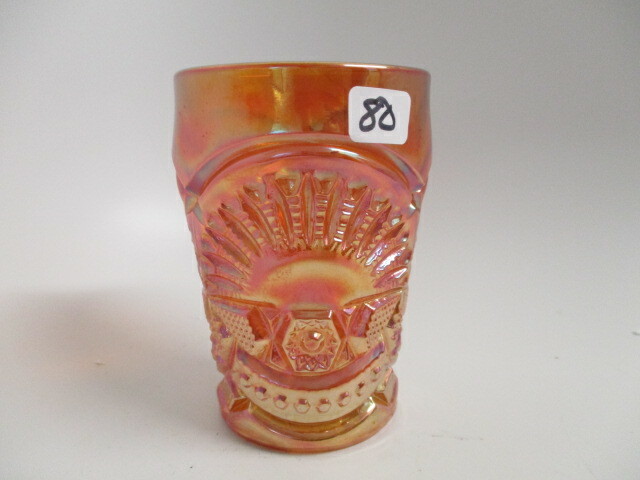 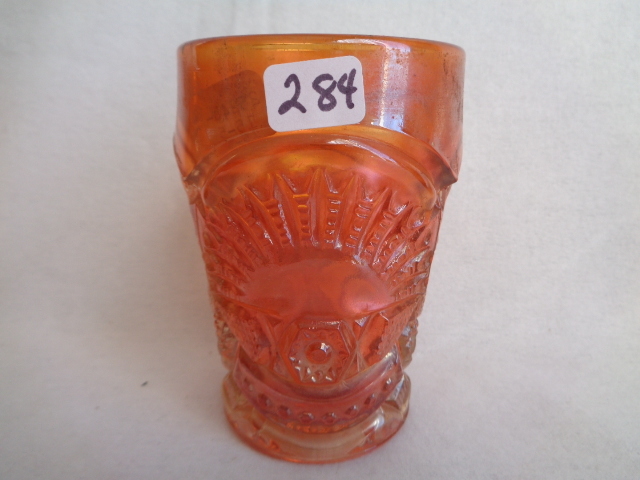 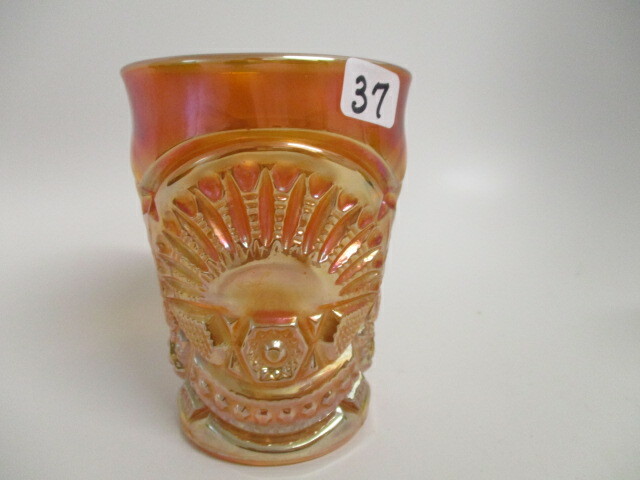 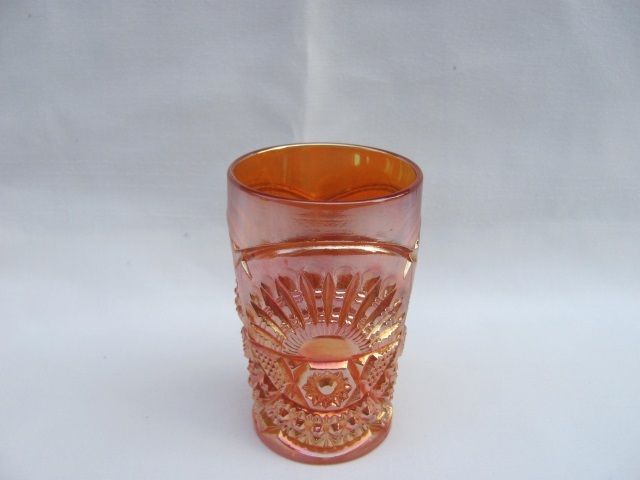 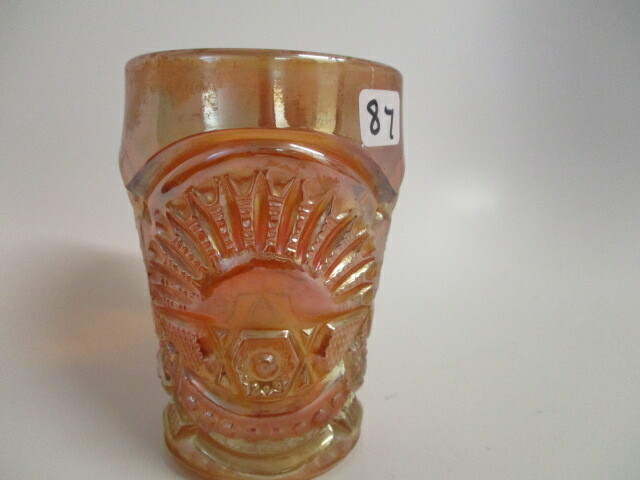 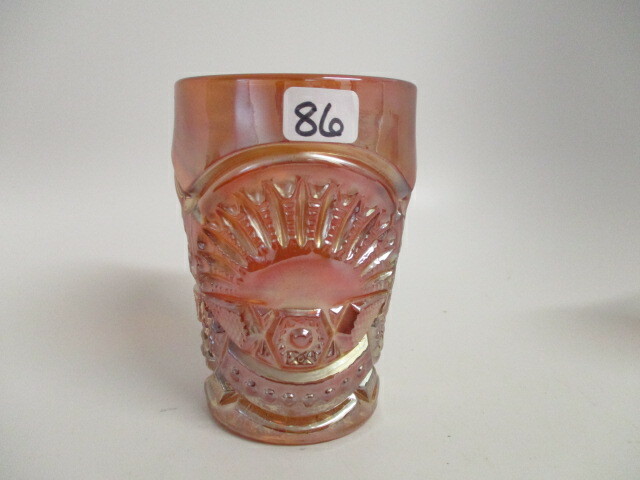 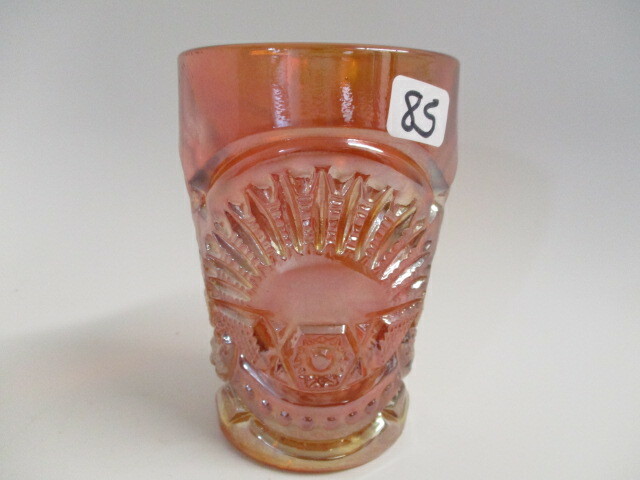 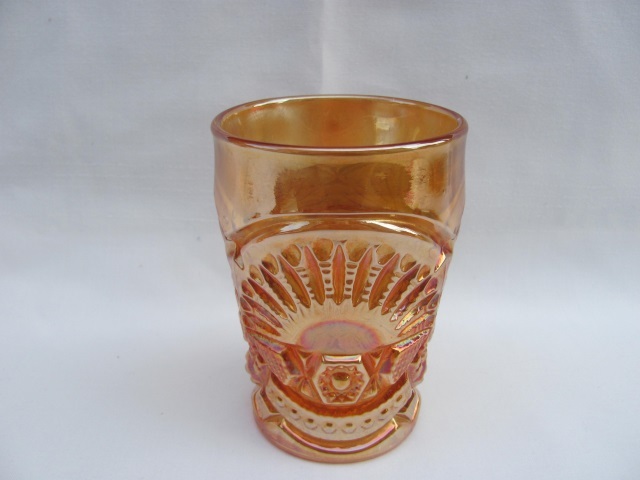 The juice glass is 3 1/2 inches tall, the tumbler just over four inches. 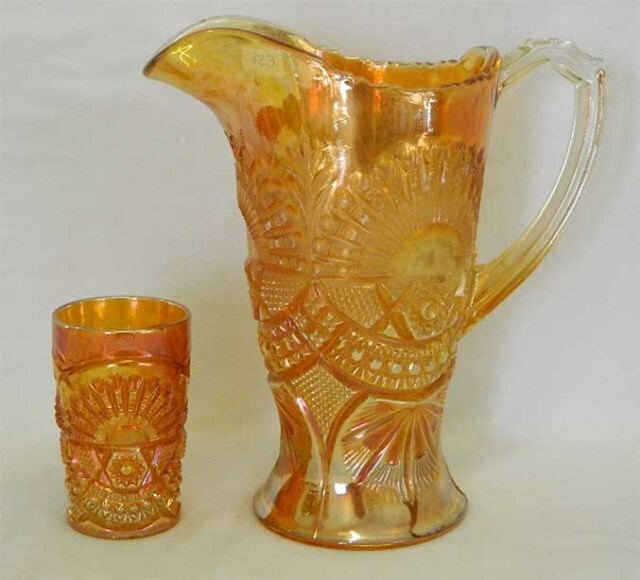 While the water and juice set pieces are the most frequently seen shapes, there were apparently others produced as well. 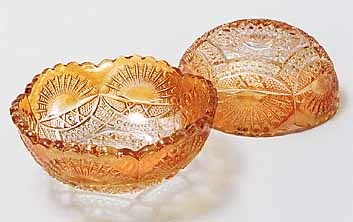 Shown above right are two small berry bowls or sauces in marigold.